Here in the Northeast we’ve missed spring completely. Our weather can be summed up in two words: Damp and Cold. In keeping with our positive, forward looking spirits, we’re planning for a warm, sunny holiday weekend. Let the picnics begin! Wine tastes better from a glass! Buy some inexpensive summer wine glasses and say “no thank you” to plastic. Ditto for silverware and plates: Your local Goodwill (or favorite thrift shop) always has silverware that’s quite cheap. Who CARES if it matches?? Or, choose from the wide assortment of compostable plates and dinnerware that are now on the market. The bottom line is that products that we use once shouldn’t be on the planet forever. Check your candles for chemicals: Ingredients in your citronella candles can include petrochemicals and artificial fragrances. These candles, while quite effective for bugs, can also irritate eyes and aggravate allergies & asthma! They’re also considered to be poisonous to dogs. Single use plastic water bottles are SO last year. Get with the program and bring water in BPA-free, reusable containers. Your local water (probably) tastes better and it’s safer for you and your family. Local food is yummy food! Grow your own or support local farms & farmers markets. Find the market nearest you with the farmers market finder (over to the right on this page). Do you have more suggestions? 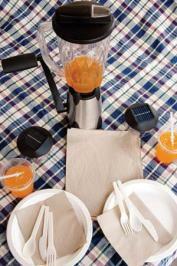 Tell us about your green picnic plans and we’ll post them here or on our Facebook page. We’d love to hear from you! Thanks again to Mary Jones!